Andrzej Panufnik was born in 1914 in Warsaw and grew up in a musical family, beginning to compose at the age of nine. He gained his diploma at the Warsaw State Conservatoire and travelled to Vienna to study conducting with Felix Weingartner, and to Paris and London for further composition studies. At the outbreak of war he returned to Warsaw where he remained throughout the Nazi occupation. Under a pseudonym he wrote patriotic songs, also playing the piano in underground and charity concerts (often piano duets with Witold Lutoslawski). All his compositions were destroyed in the 1944 Warsaw Uprising, though he reconstructed three scores in the following years. After the war, Panufnik held conducting positions with the Krakow Philharmonic and the Warsaw Philharmonic, also appearing as a guest conductor with many of the leading European orchestras such as the Berlin Philharmonic, the Orchestre National, Paris, and the London Philharmonic. In 1950 he was elected vice-chairman, with Arthur Honegger, of the International Music Council of UNESCO; and as head of a Polish cultural delegation to China in 1953, he was personally received by Chairman Mao. 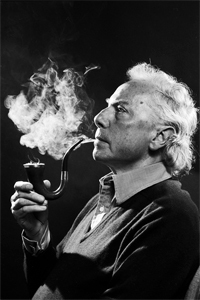 In 1954 Panufnik left Poland as a protest against political control over creative artists, resulting in the total suppression of his name and music. He settled in England and subsequently gained British nationality. From 1957-59 he was musical director of the City of Birmingham Symphony Orchestra, his last official position before deciding to concentrate on composing. In 1977, after a 23-year long silence, Panufnik's music was once again heard in Poland, and in 1990 the composer made a momentous return to his native country to conduct a programme of his works to open the Warsaw Autumn Festival. Panufnik's autobiography, Composing Myself, was published in 1987 by Methuen (UK). The composer received a British knighthood in January 1991, and following his death nine months later was awarded a Polish knighthood by President Lech Walesa. Panufnik's oeuvre is dominated by a series of large-scale orchestral works, including commissioned scores for the Boston, Chicago and London Symphony Orchestras. As well as the ten symphonies, his output includes concertos for piano, violin, bassoon and cello, three string quartets, vocal and choral music, works for young people, and transcriptions of old Polish music. Panufnik's compositions have been performed by many leading musical interpreters, including Stokowski, Horenstein, Solti, Ozawa, Previn, Menuhin and Rostropovich.